Welcome to LibraryThing is a great place to introduce yourself and ask questions. Have a question? Found a bug? Try posting in one of these groups—other users can often answer questions faster than we can! 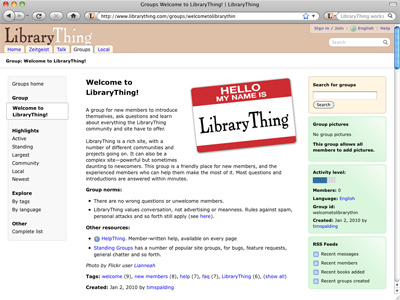 Get started, ask questions, and learn about the site in the Welcome to LibraryThing group. Report bugs in the Bug Collectors group. Ask, add, and answer questions in the FAQ Group. Suggest features on the Recommend Site Improvements group. Check out the LibraryThing blog to learn about new features, contests, and to generally stay in the know. If you have a question about any aspect of LibraryThing, feel free to email one of us. The general division of email is below, but if you're not sure who to email, or if your question is about something other than the topics listed here, email info librarything.com. We'll get your email to the right person. General questions about LibraryThing.com, questions about your account, settings, or about something you ordered in our Store? General questions about TinyCat, questions about your account, settings, or paying for your subscription? Questions about Early Reviewers, author interviews, or how publishers, authors, booksellers can use the site? Questions about LibraryThing in general, feature requests and bug reports? Questions about LibraryThing for Libraries? Still not sure who to contact? Email info librarything.com. We'll make sure your message gets to the correct person. Need to send us snail mail? The address is here.